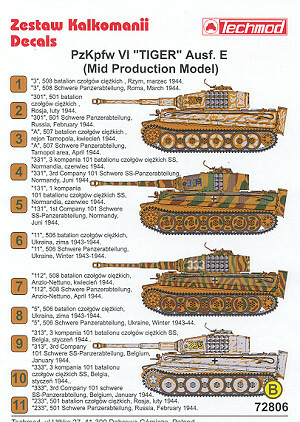 Here is the second Tiger I sheet from Techmod, this time concentrating on the mid-production model. This sheet recommends an Academy kit, but I've not heard of one in this scale. There are Tigers by Revell AG and Hasegawa in 1/72. All of these tanks have a basic panzer yellow color with either brown, green, or white over the top. Most have zimmerit. 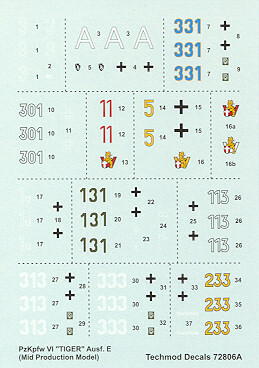 That's 11 different options and all can be used from this sheet. The schemes are superbly drawn so you should have fun with this one.